Recently, my neighborhood Asian grocery store had a lobster sale. At $6.99/lb, it was a steal that I couldn’t pass up, so I got myself a 3-lb Boston lobster. In the Chinese restaurants in the United States, lobsters are often served with Yee Mein (or “E-Fu” noodles). First, the lobster is stir-fried with ginger and scallion, and then poured over a bed of boiled Yee Mein. Lobster Yee Mein is a celebrated dish that graces wedding dinners, birthday banquets or casual dining. And that was exactly what I made. The lobster yee mein was very yummy and the taste was close to restaurant quality, but it lacked wok hei (the “breath of wok“). Cooking a big lobster at home was challenging–the wok could hardly contain the giant claws, but I managed. This coming holidays, why don’t you try out my lobster noodles recipe? Lobster Yee Mein (Lobster Noodles) recipe and pictures. 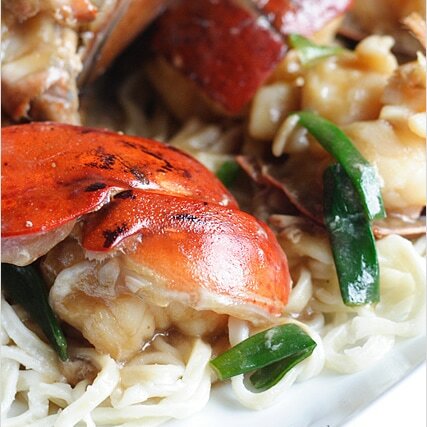 Lobster Yee Mein is a celebrated Chinese recipe that is great for Chinese dinners and banquet. I will definitely try out your recipe Rasa Malaysia! Welcome back, and have a wonderful holiday season! That looks delicious. I just saw a place in chinatown with $4.99 lobsters (yes for the whole thing). Seeing this, I wish I’d picked some up! Wow, this lobster noodles look absolutely delish and the recipe looks like it’s something I can handle. Thanks for the good idea. This Lobster Yee Mein recipe would come in handy for the Chinese New Year celebration which is just a few weeks away. Sure makes an impressive yummy dish for the family. Thanks for sharing. Oh the praries! We never seem to have lobster sales (or any type of good seafood sales for that matter). I wish I was not land locked. In the mean time I will look and drool from afar. Bee this picture is making me crazy. I want to eat my screen! Loosk fabulous. Happy Holidays! omg..thats so darn cheap..by the time they fly to malaysia..this cheap buggers costs almost ten fold..! It may not have the breath of wok but looks fabulous just the same! Yee mein is my fav type of noodle and that lobster yee mein is just too sinful to pass! There are very few great lobster dishes in the Asian cuisine since we desire the ingredient itself to play center stage. Great photo and keep writing!! Out here in San Francisco, very few restaurants make great lobster dishes. Lobster E Mein at many Chinese restaurants actually uses ladles of oil. I love lobster yee mein. I haven’t had it in ages though. It’s great that you got a good deal on the lobsters. I heard that because of the economy, the prices have fell. I’ll have to keep my eyes out too. Just picked up some lobsters at my local Chinese Market … $5.99 lb!!! Can’t wait to try your recipe out!!! Looks amazing!!! Gave your recipe a go tonight. Overall I rated it a success. For a 1.6kg lobster we went with two lots of sauce, but I think we could even increase that to 4 lots as we generally buy our lobsters cooked. We also added garlic. I tried it! It works and is very yummy. Thanks for sharing! I went out looking for a special recipe for my birthday and found your Lobster Noodles. This looks tasty. It’s simpler than some I’ve seen, too. Thanks! I wish that people would reserve comments for dishes that they have tried as that makes them useful. All of the comments about “looks yummy,” “gonna try it one day,” “I can taste it from here,” do not help those of us looking for useful critiques. This recipe is good if you doubt the recipe. I totally agreed with you as I am tired of these “look yummy! delicious! Can’t wait to try fake comments. For goodness sake, try the recipe, come back to share it. Totally love this recipe. I added another lobster, but didn’t need to. This was as good as any I have had in the San Francisco Bay area. I think the creamy lobster noodle dish I normally have at Chinese Weddings/events has a the sauce made with evaporated milk, butter, garlic powder, and onion. 2. Parboil yee mein or shrimp roe noodles(虾子面) and drain. 3. Heat Wok (or equivalent) with a bit of oil. 4. (optional) dust lobster with flour so it has that “skin” on it. 8. Add parboiled noodles to sauce in wok and finish cooking. 9. Plating: Place noodles in the center of dish, and arrange lobster pieces on top/around it accordingly. I got some lobster tails and were not sure what to do. Then I came across this recipe & tried it out tonight. It was sooo delicious. My husband loved it very much. I didn’t put the whole water portion though, perhaps only half of it. Also I used tapioca starch instead of corn starch. Thank you very much for sharing this recipe. My 11 year old requested for lobster noodles so I followed this recipe and he loved it! Thank you!